Moms, are you looking for activities that the whole family can do together? At FreePrintable.com, we understand and appreciate the need for quality family time, so we've put together a nice collection of things that you can do together. In our free printable activities, you'll find many fun projects like making your own stationery, using printable templates and making chore charts. You'll even find recipes – yes, recipes! Cooking is actually a wonderful activity to do together as a family, especially if you find some recipes that are easy for the children to help with. We've done the legwork for you, though, so all you have to do is kick back, relax and browse through our collection to find the recipes and activities that you think your family will enjoy. When you're selecting new recipes for your family, it's important to choose dishes that will have wide appeal in your family. To avoid having to make multiple entrees and side dishes to suit every palette, select some core recipes from our free printable recipes that everyone in the family will enjoy. Of course, you'll never know if your family likes a recipe before you try it, but you probably have a general idea of foods that your kids won't touch, for example. Still, children and adults alike should be encouraged to try new foods so they don't become bored. Variety is important not only to make meal times exciting, but to make meals more nutritious, too. Sticking to the same foods over and over will result in your family not getting all the nutrients they need. Remember, every meal should include a healthy serving of fruits and vegetables no matter what the main dish is. Nutrition is important, but it's also fun to have a treat now and then. One of America's favorite deserts is the Apple Pie. You've heard the phrase, "It's as American as Apple Pie," right? 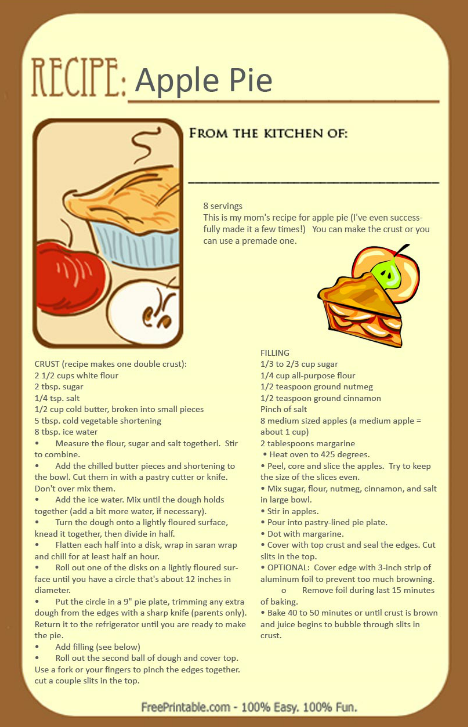 National origins aside, this is a delicious dish, especially when you use our old-fashioned, made from scratch apple pie recipe. You can see the recipe pictured below. Though we recommend that you make the crust as shown in the recipe, if you're short on time, you can always use a premade crust. It will still be delicious and no one will ever know the difference! Crusts are tasty, but it's the warm, delicious apple pie filling that really makes people go, "Wow!" Sugar, nutmeg, cinnamon and apples – it's a heavenly concoction that will produce tender, perfectly flavored apple pie filling. If you have plenty of apples, double up the recipe for the filling. The apple pie filling is delicious when hot and placed on a big scoop of cold vanilla ice cream. The pie makes a great dish to take to a potluck, reunion or family dinner. Take copies of the recipe along, too, because everyone will want it!